Little Friends Photo, Lifestyle pet photography by Seth Casteel, has announced Casteel’s new book, “Underwater Dogs” will be released October 23, 2012, with pre-order availability now. Based in Chicago and Los Angeles for photo shoots nationwide, Little Friends Photo specializes in documentary-style pet photography. This new coffee table style book contains eighty individual portraits of dogs underwater. To date Casteel’s images have amassed more than 150 million views on social media sites. Casteel was featured on The Insider, Inside Edition and Good Morning America and is also a volunteer photographer with Los Angeles Animal Services. Casteel plans to use Underwater Dogs as a vehicle to raise money for Second Chance Photos. He is also going to conduct shelter workshops across America during his book tour. According to an interview with VegasSeven.com, prior to this previous winter Casteel was just a “starving artist,” but his photographs of dogs swimming underwater catapulted his career. “In 2009, the Southern California resident and film-school graduate quit his day job in creative advertising with Walt Disney Studios to pursue his dream—photographing pets both on land and underwater—full time,” VegasSeven.com reports. 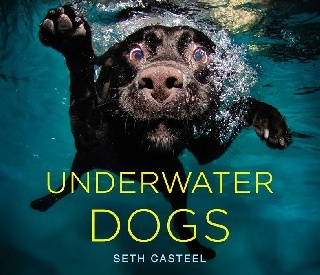 Casteel came up with the idea to photograph dogs underwater during a routine photo shoot in California. He was with a small Cavalier King Charles dog and wanted to get some routine shots. With the dog splashing in the pool and chasing after it, Casteel’s idea was born. The photographer reports being really excited about the release of his first book, “Underwater Dogs”, to be released October 23, 2012 through Little, Brown. For more information visit www.LittleFriendsPhoto.com and for pre-orders, http://littlefriendsphoto.blogspot.com/2012/05/underwater-dogs-book.html.